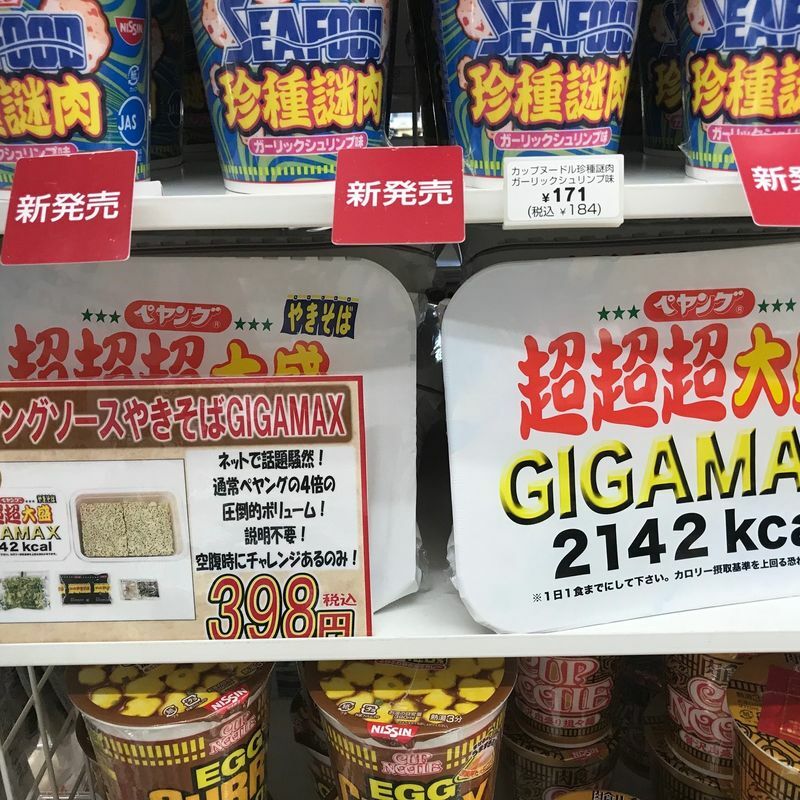 2142 Calorie Instant Noodle!? WHAT!? 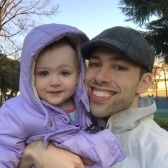 Hey again, Expat community--have you seen this craziness? I was walking through the local 7-11 and *BAM* this caught my eye. 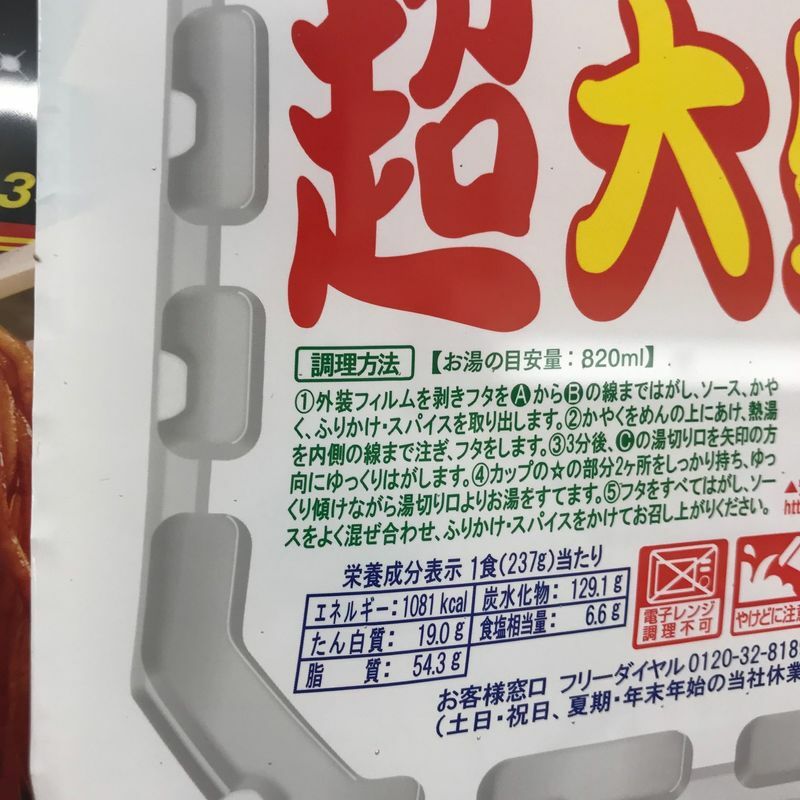 I mean, they ain't pulling any punches: the company wants you to know that this pack of instant yakisoba noodles is 2142 calories. Just for reference, that's more than the recommended daily caloric intake for most humans on this planet who aren't professional athletes (or teenagers). - They cost less than 400 yen. This means that if you have a "one coin" (500 yen) in your pocket, you can get a meal to cover all of your daily calories plus a water on the side. - The ad actually CHALLENGES people to eat the whole thing by themselves. No, really--it says so in that little ad square next to the noodles. - These were 7-11's "Recommendation of the Week." Can you imagine a place in America or Australia recommending a 2000+ calorie instant noodle as it's "choice of the week?" Man, there would be some backlash from that! - The fine print under the "2142 kcal" explains that nobody should eat more than one of those in a day. That means there is some concern that someone might just chow down on a few of these things. - Looking on the bright side, these noodles only takes 3 minutes to cook...less than some of your normal instant noodles. - These would actually make great additions to survival kits. No, really, high calories in relatively compact packaging...not a bad option. So I have to ask: has anyone out there tried this bad mama jama? If it was 10 years ago, I would've given a shot in a heart beat, but I don't think my stomach could take such a beating these days. Hitting the books once again as a Ph.D. student in Niigata Prefecture. Although I've lived in Japan many years, life as a student in this country is a first. Blessed Dad. Lucky Husband. Happy Gaijin (most of the time). That is crazy!! I could never eat all of that!!! My husband needs about that many calories, particularly in summer. He uses so many calories at work, but doesn't have an appetite due to the heat. The average factory worker could probably afford to eat two of these! @edthethe That's a great point about your husband and other folks who have to work out in the heat. They definitely need the calorie boost in the summers here! OMG! That is crazy! Even though it’s all the calories and then some in a single meal, I don’t think it’s a case that anyone will be eating from that 3 times for the day so they have ‘3’ meals for the day. Besides are those healthy calories? I don’t think so.... I’d definitely avoid those. Wait, you need *what* for me to volunteer at the festival??? Are Japanese Band Names Crazy, Awesome, or Crazy Awesome?